The combination of Glucosamine, Chondroitin and Collagen is used to aid in maintaining healthy joints. This combination is primarily used to treat osteoarthritis along with various inflammatory joint diseases. With increasing age, problem of wearing out of the normal smooth cartilage surfaces of the joints occur. Cartilage is a slippery tissue that covers the ends of the bone in joint. It acts as a cushion between bones of joint. The main function of the cartilage is to act as a shock absorber and reduce the friction between joints. Inside joints, cartilage undergoes a constant process of breakdown and repair. However to be properly repaired, the building blocks of the cartilage must be present. 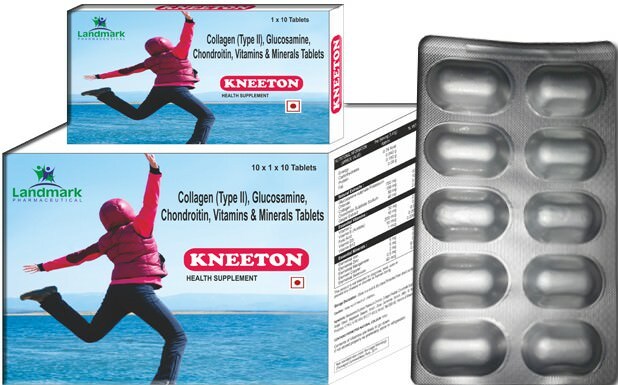 Both Glucosamine and Chondroitin are natural components of the glycoaminoglycans in the cartilage and other connective tissues in the body. With age, cartilage become stiff and loses its elasticity which make joints prone to damage and this may leads to joint pain, swelling, loss of movement and further deterioration; leading to Osteoarthritis and other joint problems. 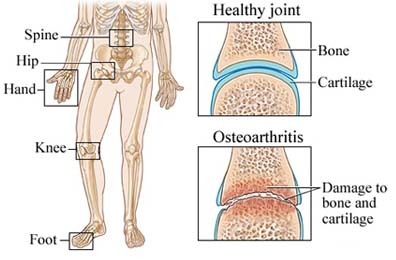 ● Osteoarthritis is the most common form of the arthritis. It is a degenerative disease characterized by breakdown of the joint cartilage; causes pain, swelling, and reduced motion in joints. ● It can occur in any joint, but usually it affects hands, knees, hips or spine. Thus, Glucosamine, Chondroitin and Collagen Combination act as a nutritional supplement for people suffering with osteoarthritis and other inflammatory joint disorders by promoting cartilage health, improves consistency of the synovial or lubricating fluid in the joints leading to better functioning of the joints. It enhances the body's ability to repair cartilage and other connective tissues and improves flexibility. ● Besides promoting the synthesis of the proteoglycans, it is also able to depress cartilage degradation by inhibiting the action of the catabolic enzymes, which are over-expressed in osteoarthritis. ● It also stimulates the synthesis of extracellular matrix macromolecule which provide the structural and biochemical support to the cells along with anti-inflammatory properties (independent of the prostaglandin synthesis). This combination is quite safe. Show side effects unless the person is allergic to any of the component.